When the candidates, appearing in their second and likely final debate, were asked about a statement made by Texas-based Exxon-Mobile that the risk of climate change is clear and warrants action, Cruz’s response led to one of the more heated exchanges of the night. And Cruz said that ideology has had led to O’Rourke voting in favor of a $10 tax on every barrel of oil — a claim O’Rourke had already denied. On the topic of healthcare, O’Rourke said he would expand Medicaid in Texas, introduce Medicare as an option on the health exchange and introduce a plan to create universal health care — a campaign promise Cruz said would raise the national debt by over $32 trillion dollars. O’Rouke fired back at Cruz when both were asked if the Trump administration’s tariffs threaten the growth of the Texas economy. “The people of Texas — I will say especially the Hispanic community — we don’t want to see taxpayer-funded, Medicaid-funded abortions and late-term abortions,” Cruz said. And because of their”massive divide” in philosophy, Cruz said O’Rourke is out of touch with the attitudes of most Texans. O’Rourke responded that he simply wanted justices that believed in civil rights. “I will only vote to confirm a Supreme Court justice who believes in a woman’s right to make her own decisions about her own body, and who has the health care access to be able to do so,” he said. 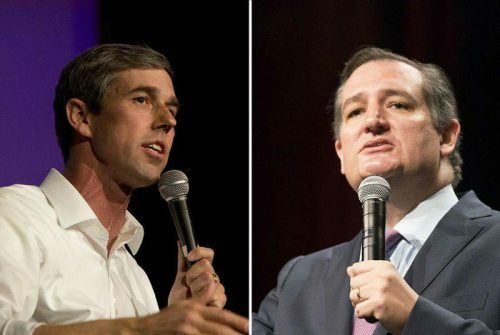 Cruz and O’Rourke were also asked about the appointment of Bret Kavanaugh to the Supreme Court, and whether or not the country should prepare for changes to the abortion law. On the topic of border security, Cruz said O’Rourke’s stance would be a threat to national security. The El Paso Democrat said the U.S. should shift its focus to beefing up ports of entry. “Having a better idea of who and what comes into our country demonstrably makes us safer,” O’Rourke said. Cruz and O’Rourke also addressed the victims of Hurricane Harvey. O’Rourke was asked about his vote against a bill that would’ve provided tax relief for victims. “I’ve voted for more than $136 billion in aid to support those communities who’ve been hit by natural disasters, including Harvey,” he said. “And in the specific bill that you’ve asked about, the tax relief was not as great as we have seen for those who’ve been through other natural disasters. Cruz simply touted his own record. He added that one bill he co-authored with Sen. John Cornyn secured $5 billion in tax relief for Harvey victims and had widespread bipartisan support in Congress. O’Rourke is scheduled to participate in a live CNN town hall on Thursday. Cruz rejected the network’s invitation to do a competing event. Meanwhile, Trump — a Cruz adversary during the 2016 presidential campaign — has endorsed Cruz and will hold a rally in Houston for him on Monday, the first day of early voting. Ryan Poppe, Rachel Osier Lindley, Dan Katz and Fernando Ortiz contributed to this report by the Texas Station Collaborative, an initiative that connects the newsrooms of Texas’ four largest public radio stations: Texas Public Radio in San Antonio, KERA in North Texas, KUT in Austin, and Houston Public Media. This entry was posted in KRTS News and tagged Beto O’Rourke, Debate, Ted Cruz, TXDecides, TxSen. Bookmark the permalink.